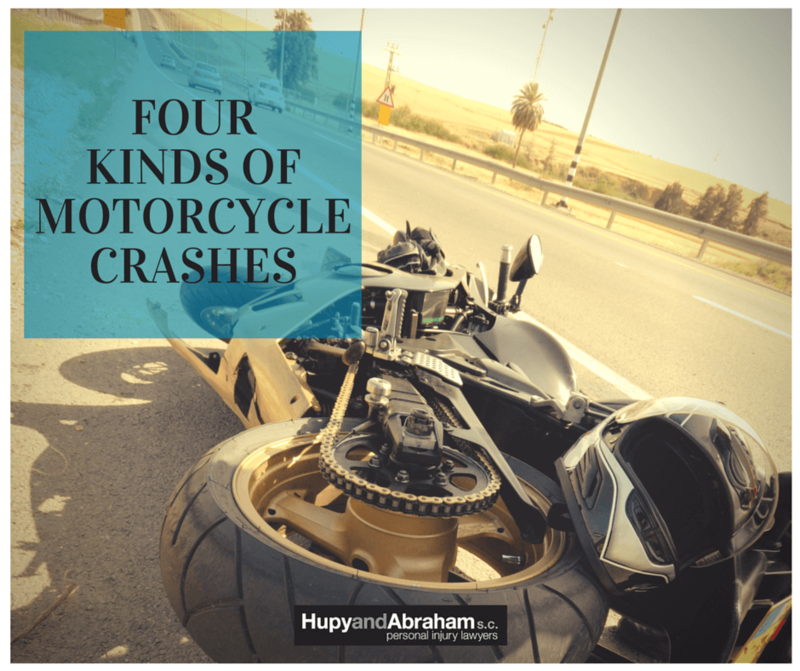 Common Types of Wisconsin Motorcycle Accidents | Hupy and Abraham, S.C.
Every motorcycle accident is unique. The people who are hurt and the pain that is endured is deeply personal. However, there are common types of Wisconsin motorcycle accidents that often result in these injuries, and if you are a rider or someone who loves a rider then it is important to understand the types of crashes that may occur. T-bone crash. T-bone accidents commonly occur at intersections when one vehicle is traveling straight and the other vehicle is attempting to make a turn. Many motorists fail to see or accurately judge the distance of motorcycles and may hit a motorcycle on the side where the rider sits. The resulting injuries may include things such as broken bones, brain injuries, spinal cord injuries, and death. Rear-end accident. In 2013, 272 rear-end motorcycle crashes occurred in Wisconsin. When a rider is hit from behind, the results can be devastating. The force of the impact can cause the rider to fall over his handlebars and potentially cause the bike to fall on top of him. The law in Wisconsin used to allow insurance companies to reduced payments to riders who were rear-ended and who were not wearing helmets. However, attorney Michael Hupy helped overturn that helmet law and he was personally thanked by the Governor of Wisconsin for doing so. Head-on collision. Thirty-six head-on collisions involving motorcycles were reported in Wisconsin during 2013. Head-on collisions are among the most deadly types of motor vehicle accidents for all motorists, but motorcyclists are at particular risk of serious or fatal injuries because they lack the protective metal and safety features that help guard car and truck drivers from devastating injuries. Left-turn accident. Left-turn accidents are a common and dangerous type of motorcycle crash. Often, they occur when a vehicle is attempting to make a left turn and fails to see a motorcycle. The point of impact may be anywhere on the bike and the resulting injuries may depend on where that point of impact was and the speed of both vehicles at the time of the crash. While the actual crashes described above are different, they are often caused by the same factors and they often result in similar injuries. If you have been hurt in any kind of motorcycle accident then please take action to protect your future. Contact an experienced rider and lawyer who will fight for you by starting an online chat with us today. What Causes Wisconsin Motorcycle Accidents?